The FTSE All-Share Index, originally known as the FTSE Actuaries All Share Index, along with the FTSE 100, represent nearly all of the market capitalisation and the top 100 companies by size listed on the London Stock Exchange respectively. They are mentioned in all BBC news bulletins. When they go up, we all feel better. When they go down, they are seen as portents of doom. Figure 1 shows the ACI and each of the components. 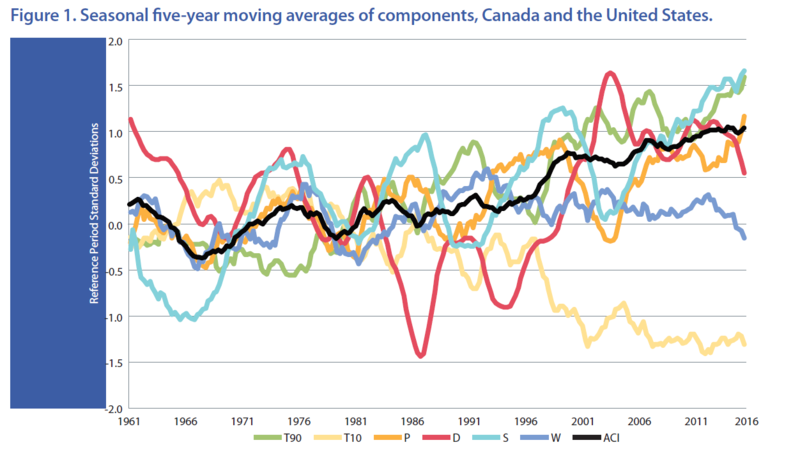 The composite ACI represents the average of the six components (with sign of change in cool/cold temperatures reversed). The ACI is increased by reduction in cold extremes, consistent with increased melting of permafrost and increased propagation of diseases, pests, and insects previously less likely to survive in lower temperatures. 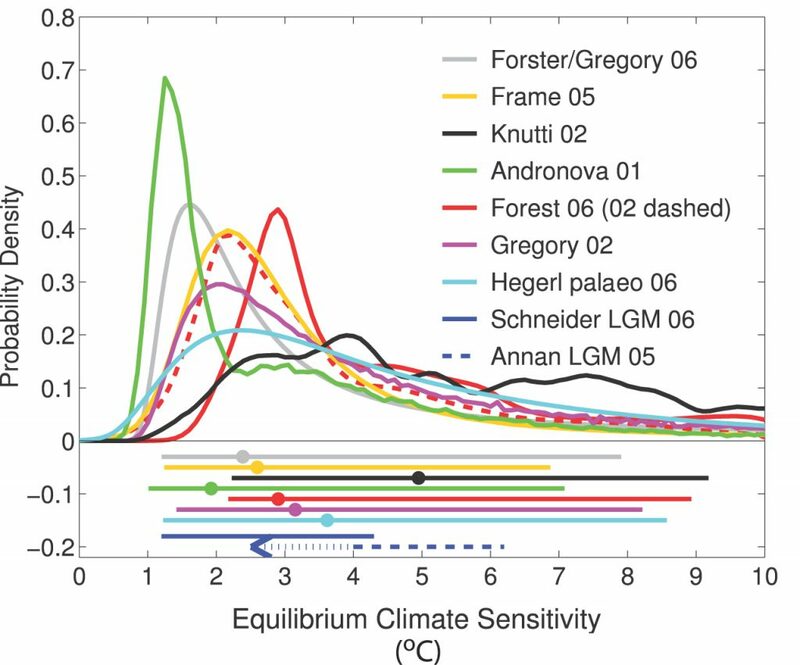 A positive value in the ACI represents an increase in climate-related extremes relative to the reference period. It then tracks them all over time, as shown in the graph above. In the heat wave of summer 2003 in Europe for example, more than 70,000 excess deaths were recorded, with the frequency of such events steadily increasing. Globally, the number of reported weather-related natural disasters has more than tripled since the 1960s. Every year, these disasters result in over 60,000 deaths, mainly in developing countries, which means that 40,000 of those deaths pa can already be directly attributed to climate change. On the other hand, the 500,000 additional cancer deaths and 10,000 additional suicide deaths since 2008 cannot be attributed directly to the 2008 crash, as the analysis shows. These are more a result of the austerity policies which have been applied since 2008. Unnecessarily. Climate change on the other hand does not care whether we react to it or not. It will relentlessly change the chemistry and biology of everything around us as the Earth and the inhabitants of the Earth adapt. We may survive it, in reduced numbers, or we may not. The Earth does not care. Responding to the threat will not make more climate-related events happen unless our response is to, by and large, ignore it. 2. One depends on the other. We cannot base our economies on a FTSE-led GDP-growth-at-all-costs model because it is not physically possible to maintain it without losing the environment from which our growth originates. As Finbarr Livesey points out in his excellent From Global to Local, the circular economy which the overwhelming consensus of studies show would increase employment and contribute to economic growth is taking a long time to arrive. In Europe, where we consume around 16 tonnes of stuff each per year, figures from Siemens in 2016 suggest that 95% of it and its energy value is lost through the life cycle of the products themselves. As Kate Raworth and others have pointed out, we need to focus on different measures of success if we are going to direct our economies in a more sustainable, less volatile and doom-laden direction. There are plans to extend the Actuaries Climate Index to Europe (including the UK in this instance! ), with a recent feasibility study concluding “that the prospects for constructing an analogue to the Canada-US ACI over the European region are promising”. I hope we see such an index soon, because, as Randall Munroe illustrates here, we have not been here before. I look forward to the day when a new global actuaries’ climate index is on every news bulletin, making us feel better when it goes down and seeing any rise as a portent of doom. Because this time it really would be. 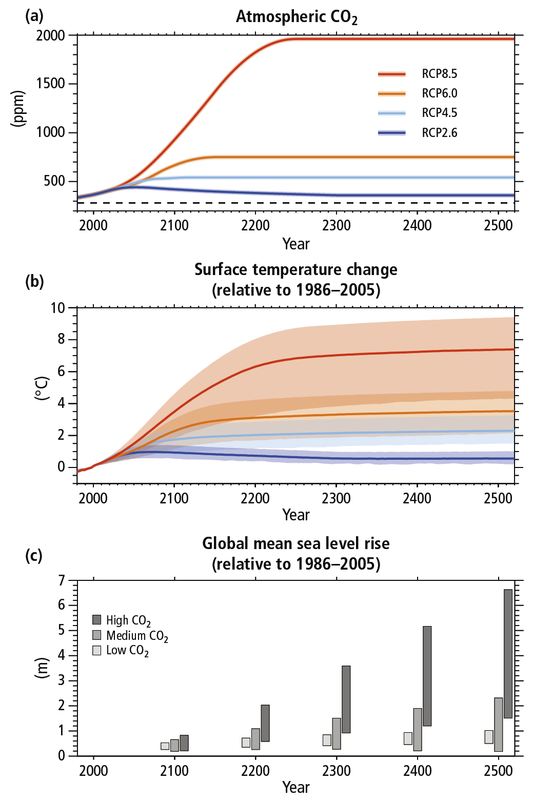 Great infographic from futurism.com summarising the likely impacts of each additional degree in warming which I thought was definitely worth sharing!